Lubricating oils and greases are formulated to satisfy specific kinds of service. If not handled and stored properly, the can deteriorate or become contaminated and, as a result, provide inadequate lubrication or become waste which requires disposal. Drums, pails, and cans of lubricants from virtually all suppliers are leak proof and clearly labeled with a brand name and type of lubricant inside. Careless handling, however, can cause leaks, contamination of the contents, and smudge, tear, or otherwise damage the labels. The 55-gallon drum is the most common lubricant container used by industry. Care is the key to safe drum handling. A full drum weighs about 450 lbs and, if handled carelessly, can injure workers or damage plant property. Do not unload drums by dropping them from the delivery truck or freight car to the ground or unloading dock. The drum’s seams can be punctured or burst, resulting in a hazardous spill situation. Correct unloading procedures will prevent damage to drums and injury to personnel. Delivery trucks generally have hydraulic lift gates to lower drums to the ground or unloading platform. Hand-winch hoists can do the same. Drums can also be unloaded from trucks or freight cars by sliding them down wood or metal skids. Before unloading with skids, set truck brakes and chock the wheels. Attach skid to the truck or freight-car bed securely. NEVER allow a drum to skid or roll under it’s own momentum — always keep direct control. Once unloaded, the drums should be moved immediately to the storage area. The best way is by fork truck, with the drums secured on pallets or held by fork jaws. If using fork jaws, the jaws must have adapters that take the same shape or curvature of the standard 55-gallon drum. Standard straight jaws will require too much squeeze pressure to keep the drums elevated. If fork trucks are not available, barrel trucks or drum handlers can be used. If the floor between the unloading and storage areas is flat and smooth, drums can be rolled into the storage area. from its upright position to its side. Two people should handle any repositioning and rolling of a drum. Again, NEVER allow the drum to roll under it’s own momentum — maintain firm control of drum speed. The best place to store lubricants is indoors and in one designated area. 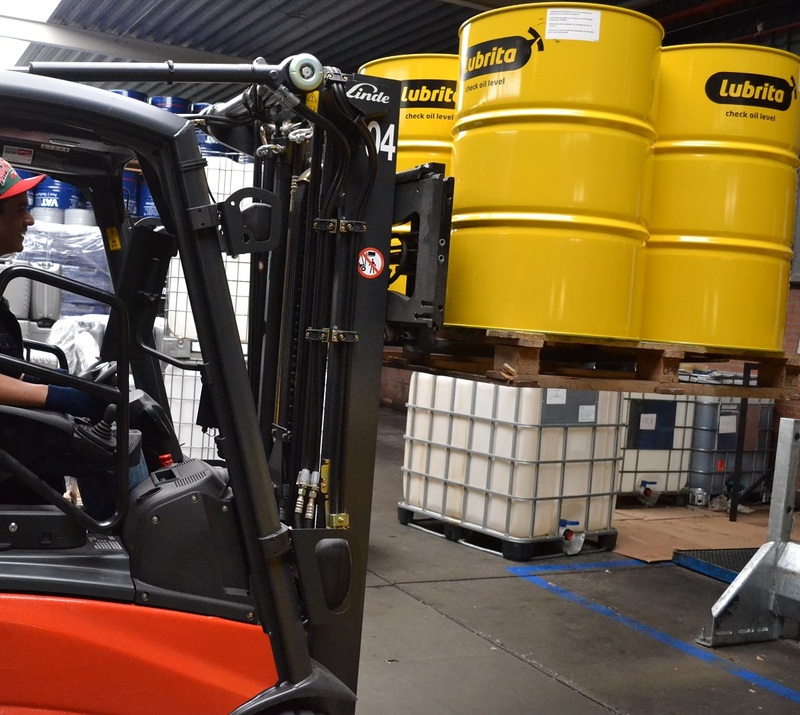 Lubricants stored in various locations throughout the plant can become a control issue by making accounting and inventory management difficult. Racks and shelving that adequately protect all containers should be provided along with a device to hoist the drums. Do not store lubricants near steam lines or heaters. Each type of lubricant should be easy to reach. Older stocks should be rotated to the front to prevent from going beyond shelf life or expiration dates. A first-in, first-out rule will eliminate the risks of deterioration caused by lengthy storage. Storing lubricants outdoors is poor practice. If lubricants must be stored outdoors, however, take certain precautions to minimize harmful effects. A temporary shelter, lean-to, or waterproof tarpaulin will protect the drums from rain and snow. Place the drums on blocks or racks several inches above the ground to prevent moisture damage. They should be placed on their sides with bungs (port holes) horizontal to each other. In this position, the underside of the bungs are submerged by the drum contents thus preventing the drum from breathing in moisture. For maximum protection, the drums can be placed on end (bung end down) on a well-drained surface. A drum that has a bung on the side should be stored on end or on its side, with the bung down. If the drums are stored on end with bungs on top, water may seep into the drums through the bungs and contaminate or destroy the contents or form rust on the inside of the drum. Rain or condensed atmospheric moisture which collects inside the chime can be drawn down through the bung as the drum breathes with the rise and fall of ambient temperature and pressure. This can occur even if the drums have never been opened. Drums that must be stored outdoors with the bung end up should be tilted on blocks with the bungs parallel to the block to keep water away from the bung openings. Bulk quantities of oil and grease are delivered to the plant in tank trucks or railroad tank cars and are pumped into storage tanks or bins. Unloading bulk lubricants can be hazardous, so only trained employees should be assigned to this task. Bulk lubricants should not be stored outdoors because of the risk of contamination by water as the vents and filler openings at the top of the storage tanks breathe. Temperature extremes and changes will have some adverse effect on bulk lubricants as on those in drums. If outdoor storage is necessary, all openings on the bulk tanks should be checked for tightness and properly secured. A tarpaulin or roof placed over the tanks will protect them from rain and snow. Storage tanks and bins in a warehouse or oil house should not be placed near heaters, steam lines or any other plant equipment that generates high temperatures. Tanks and bins should not be stored in cold areas either, or where temperatures cycle from hot to cold extremes. Do not used galvanized tanks or piping to store lubricants that contain additives which may react with zinc to form a soap-like sludge in the lubricant. Under some inside conditions, moisture may condense inside oil tanks. Moisture intake can minimized with the use of dessicant breathers and condensate can be removed through the bottom drain, or pumped out with bottom-fed pumps. In bins containing grease, the condensate will collect on top and can be siphoned off. In either case, it is important to remove the water promptly to prevent rust from forming inside the bin and contaminating the oil or grease.